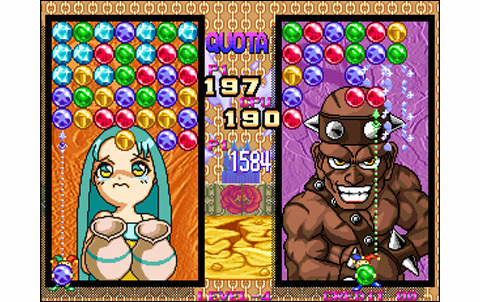 The game features a "puzzle mode" in which you play alone in a competition against the clock, or a "VS CPU mode" which is no other than the classic "story mode" where you face different opponents controlled by the machine. 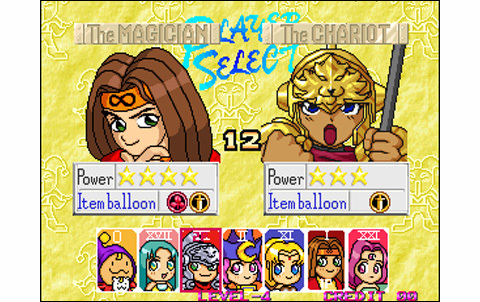 Of course, there's also the versus between players available as soon as you press start on controller 2. 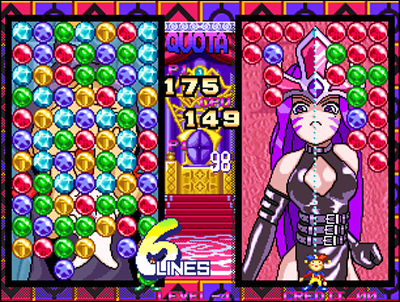 The principles are simple: blocks of colored balls come from the top of the screen. 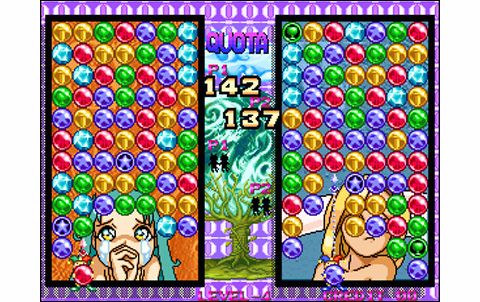 Blue, yellow, red, green : dozens of balls are randomly coming down notch by notch. It's all about removing them all before getting overwhelmed! 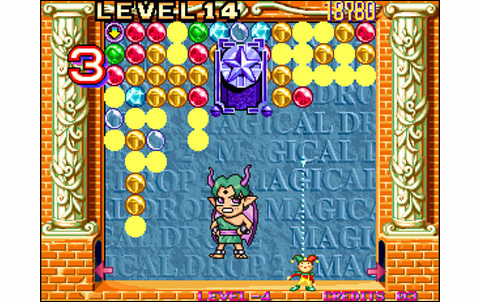 The player controls a small figure at the bottom of the screen. This one can move laterally,step by step. 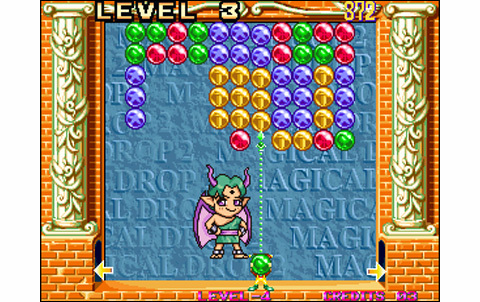 By pressing the A button, the colored balls located above our character are catched: beware , only one color at a time! You can move across the width to get more balls of the same color as the first picked, but can't mix. 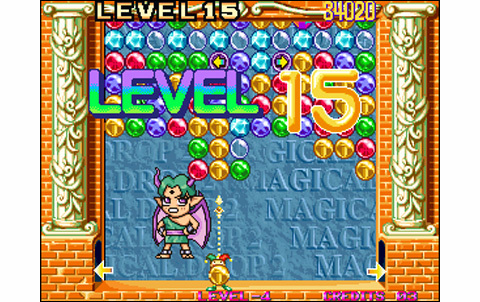 By using B, you send back all the balls collected. If you unite more than three spheres of the same color this way, they explode . Where the concept becomes interesting is that our spheres undergo a "reverse" gravity. This leaves the door open to many strategies and combinations! 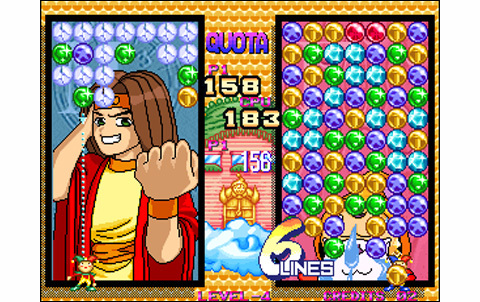 In fact, with a little imagination, you can set one or more chain reactions or "combos", and thus maximize the efficiency of our attack. 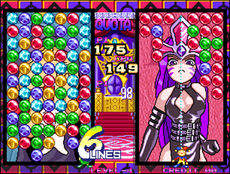 The interest is that in versus mode, the more lines you destroy in a row, the more you fill with balls the opponent's area! 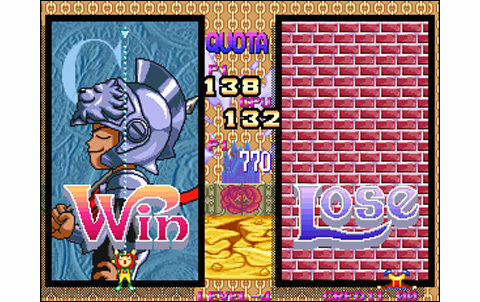 This is pressure... but be aware that your rival can reverse the situation just as quickly! To further spice up the debates, various objects are scattered throughout the playground. Blocks of granite, fetishes associated with a color (which destroy all corresponding blocks when itself destroyed), air bubbles that have to be burst, explosive prisms... 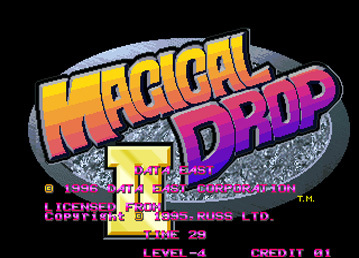 Magical Drop II is very interesting, and developing techniques around this well-crafted concept turns to be very taking! The icing on the cake is that Data East has tweaked the realization! 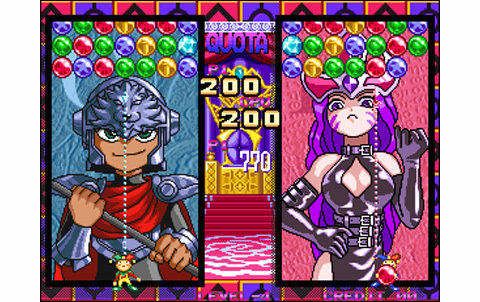 Yes for sure, "childish and cute" style have been seen again and again in puzzle game, but MD2 offers some originality: the characters are personalities of the tarot! 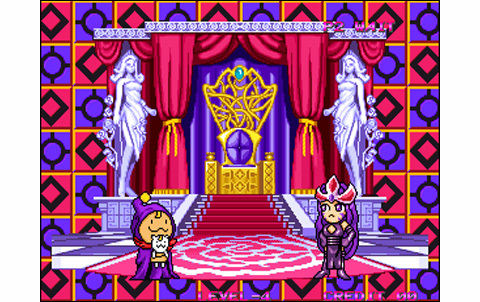 The Fool, The Star, The Chariot, The High Priestess, The Justice, The Magician, The World... without forgetting the two Bosses: The Black Clawn and The Empress. All these figures are designed in a never seen before way, like playful childrens! They're very well drawn, gesticulating happily in the background during the events. 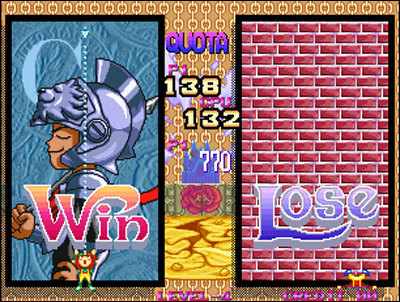 The animation is pretty satisfying for a puzzle game: it's alive, speed, well-crafted. 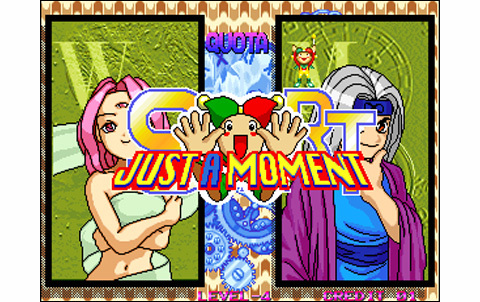 Each character expresses himself during the debate, accompanied by good sound effects and some nice melodies. 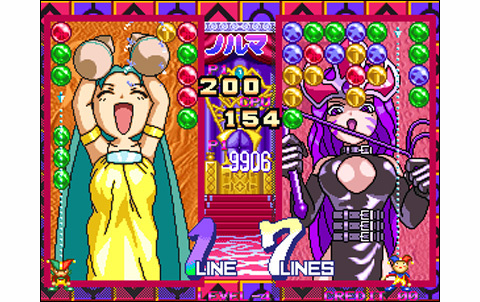 With Magical Drop II, Data East makes a great puzzle game for the Neo Geo: Although less popular than Puzzle Bobble, the soft is one more mega-hit of the genre on the system... and it has absolutely nothing to envy its rivals! 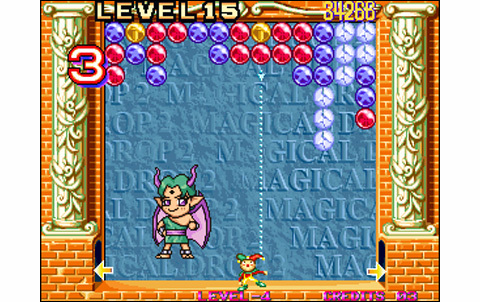 For a puzzle game, Magical Drop II is especially nice! 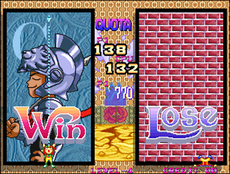 Game interface is colorful and well drawn, the backgrounds and characters pretty cute: not bad! 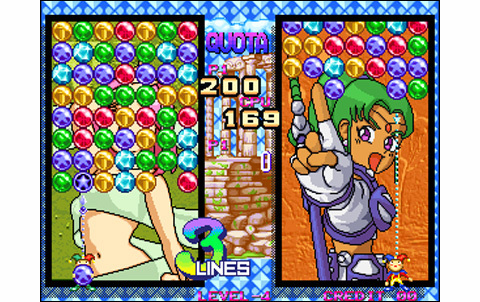 Action is speedy, there are characters in the background gesticulating during the duels and the balls are full of details. 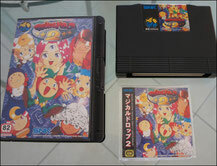 Melodies are maybe few but they're still more than in Puzzle Bobble, and they're very beautiful! Effects and voices are also well made, it's all good. 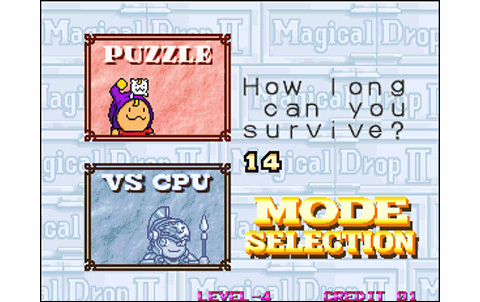 With a simple code, you can select among ten (instead of eight) different characters! The story mode is not very long, but each hero have its own ending. Of course, competition with friends give infinite RV to MD2! 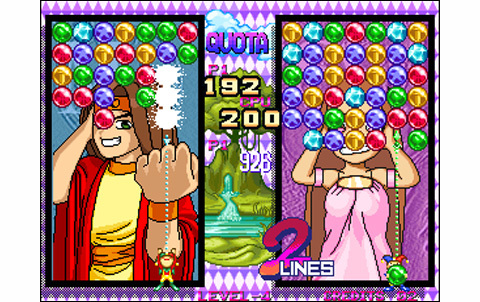 The combos give another dimension to the action: fun and taking, Magical Drop II stands as an excellent alternative to Puzzle Bobble. 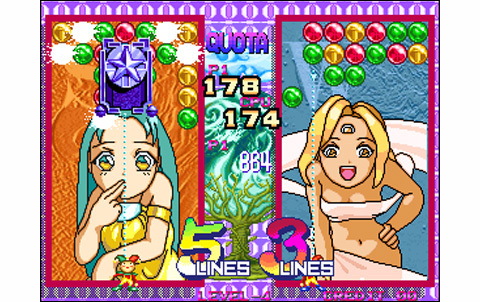 Data East signs here one of the best puzzle games on the Neo Geo, offering a realization, a replay value and a gameplay rarely equaled. 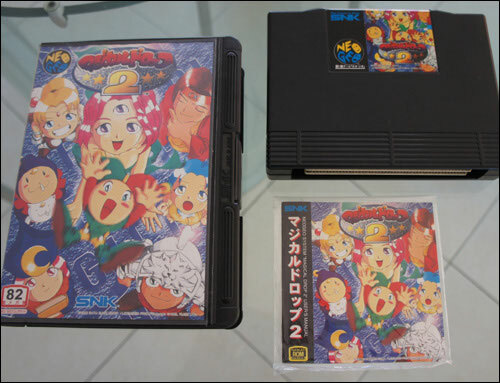 The two Magical Drop games available on the Neo Geo are golden nuggets for the collectors. Extremely rare, these two jewels are now literally out of reach for any person with a "player" point of view. 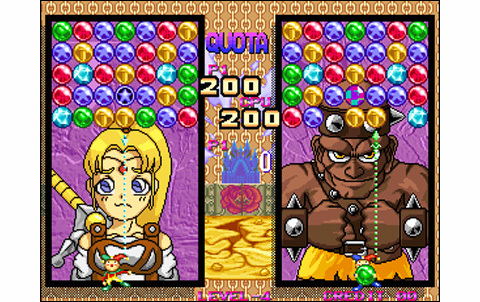 Go for the Puzzle Bobble conversions instead.